Keep reading for much needed information for when you decide to dive Grenada....We had a chat with Scuba Tech of Grenada, West Indies. Sabine Lenz was gracious enough to let us know more about scuba diving in Grenada and Carriacou. What visibility should visitors expect when they dive Grenada? Depending on dive site and weather visibility can vary from 10 to 30 meters. What are the busiest time for diving in your country? Christmas is the busiest for most visitors coming to dive Grenada . When are the more laid back times for diving? 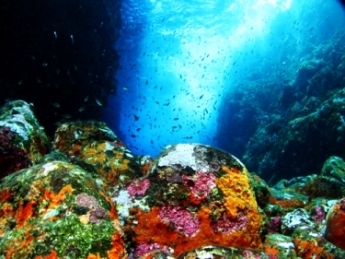 The summer month offer fantastic diving with outstanding visibility. Tell us about some of the dive sites visitors MUST discover during a dive trip to Grenada and Carriacou. The Bianca C. - The Titanic of the Caribbean, a 200m/600ft. cruise ship that sank in 1961 impresses by it's sheer size. Home of eagle rays and reef sharks. The Underwater Sculpture Park - a Must See for divers and snorkelers alike. Founded by The British artist Jason deCaires Taylor this beautiful reef hosts several statues from national and international sculptures and is the first of it's kind world wide. The Atlantic wrecks Hema 1 and King Mitch - the most challenging and rewarding dives Grenada has to offer. Big schools of eagle rays, reef and nurse sharks, turtles, lobsters and barracudas are regular guests a the wrecks. Depth and current make those dives really interesting. Special Trips to the North End of Grenada - a few uninhabited islands between Grenada and Carriacou offer unspoiled diving in crystal clear water. Everything is a little bigger here. Stunning coral gardens and endless drop offs are the home of giant eagle rays, turtles and reef sharks. To complete the Robinson Crusoe feeling ScubaTech combines this trip with a beach BBQ (freshly caught fish or lobster) on an endless palm fringed beach on one of these stunning islands. Which accommodation options would you suggest to divers? Grenada offers a great variety of accomodations. Starting from beatiful self catering cottages right at the beach to first class hotels with anything your heart wishes for. As ScubaTech works with one of the biggest Caribbean tour operators we can offer a best accomodations in any price Range. What marine life are commonly found around Grenada and Carriacou? During our dives wie regularly see reef and nurse sharks, eagle and sting rays, turtles, barracudas, lobsters and the occasional sea horse. Are there any marine life that visitors would be surprised to see when they dive Grenada? Grenada is a very popular nesting ground for leatherback turtles. It is really amazing to see those creatures emerging from the Sea and climbing up the beach to lay their eggs. What top dive sites would you suggest for beginner divers? The Marine Park offers perfect conditions for the not so experienced diver. Beautiful reefs with a stunning marine life make it a favorite for divers of all levels. What top dive sites would you suggest for more intermediate to advanced divers? Shark reef, Tommy's reef and the Atlantic wrecks as well as the Bianca C can be really challenging dives and require very often quite a bit of experience when you dive Grenada. What is the most famous wreck around Grenada and Carriacou? The Bianca C is Grenada's most famous wreck. What makes this wreck so special? Her sheer size! The Bianca C is considered the biggest wreck in the Caribbean and has the nick name "Titanic of the Caribbean". Tell us the story about how this vessel became such an exciting wreck? After she caught fire in the Port of St. George's an English war ship dragged her out and wanted to beach her at the South end of the island. (Un)fortunately the tow line snapped, she circeled a couple of times and sank to the seabed 52m/ 168ft below the surface. Today she is beautifully encrusted with corals and home of an abundance of marine life and very popular with recreational and technical divers. Are there any other wreck dives that visitors must attempt when they decide to dive Grenada? Grenada is famous for it's wrecks and it would be a shame not to visit the Shakem or the Veronica L just to mention a few. Both wrecks are very popular with underwater photographers and featured in many dive magazines. Is there anything that would surprise new visitors to Grenada? Grenada has by far the friendliest people in the entire Caribbean. It is the lushest of the islands and offers an amazing flora and fauna on land as well as under water. You can't describe Grenada - you have to feel it! Thanks to ScubaTech Dive Center for taking us around Grenada for another dive adventure!